Don’t let liberals pick off conservatives; Leadership should stand strong. 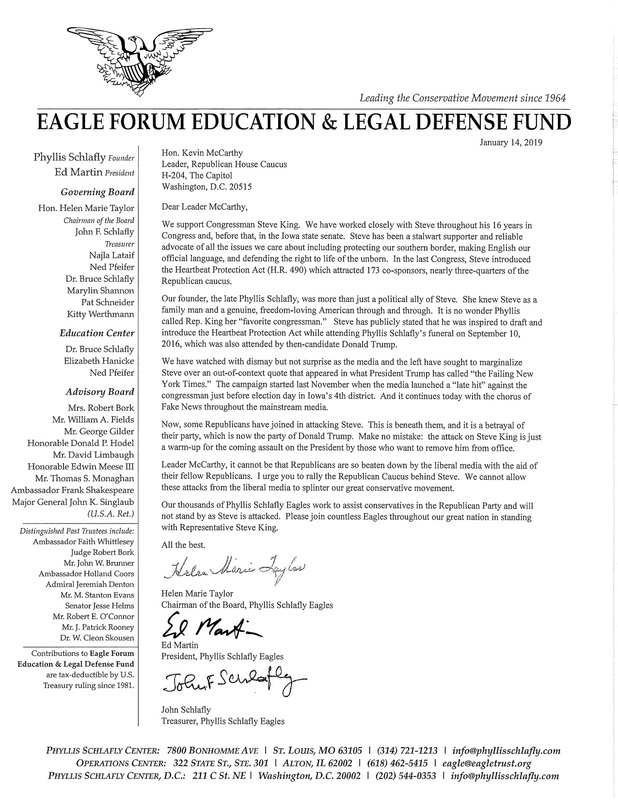 Washington, D.C.: Early this morning, the leadership of Phyllis Schlafly Eagles sent a letter to GOP Leader Kevin McCarthy expressing support for Steve King and dismay over leadership’s decision to take action against him. The letter was signed by Chairman Helen Marie Taylor, President Ed Martin, and Treasurer John Schlafly. “We know all too well that the fake news looks for any chink in the defenses of conservatives,” said Ed Martin, president of Phyllis Schlafly Eagles. “Steve King is a strong conservative advocate who is often willing to take up the fight others aren’t. We cannot let the left successfully use an out-of-context remark to paint a good man as something he is not. And we cannot allow liberals to use the typical playbook of scaring GOP leadership into ‘distancing’ themselves from solid conservatives who add only good to the policy process. You may read the letter in full here or by clicking on the image below.